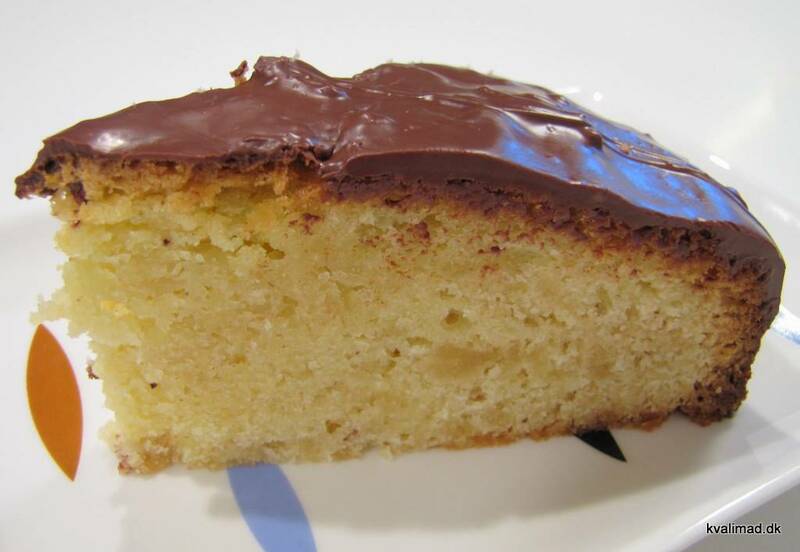 A Danish cake classic. Heavy and spongy. Once again a variation on a pound cake. It's actually just a sponge cake with marzipan. But once again, it is a variation that is worth the effort. Grate the marzipan as fine as you like. Mix everything together in one of the bowls. Pour the batter into a greased spring form. Mix all the wet ingredients together in food processor. Break up the marzipan into small pieces and put that in too. You do not need to melt the butter. Blend it into a creamy batter. It might look like it is separated. That is ok. Mix the dry ingredients and only blend until all the flour is blended in. Bake for 40 minutes at 180°C (355°F) in a greased spring form. It is done when no unbaked dough sticks to a meat pin or knitting needle. A small spring form makes a high and thick cake, and a large spring form makes a low and thin cake. A thick cake takes a lot longer to bake than a thin cake, so I have sometimes experienced that it takes up to an hour in a smaller spring form. Let it cool for at least 20 minutes before you put on the ganache. Melt the chocolate in the cream in a heavy-bottomed saucepan, at a low temperature. If you want a large cake, you can bake it in large roasting pan instead of spring form. You just multiply the ingredients by 2½, so for example, you get 500 g (1 lbs) of sugar. However, you can simply multiplying ganache with 2 times. There will be enough anyway. The reason to use half potato starch and half wheat flour, is to make the cake more porous. It's the gluten/protein content of the flour that makes it a chewy dough, and results in air bubbles in the dough. Then when you mix in the pure starch from potato flour, it is equivalent to using flour with a low protein content. Hi! This dessert looks incredibly tasty! Would you be able to add "Pinterest" so that us Americans can share this with others?